If you are after a catfish then Float Fish Farm could be worth a try. Fishery regular Simon Irons caught this fine specimen from the Sands Pool. Round Two of the HAJAC Winter League saw anglers on the Old Nene at Benwick and the Twenty Foot Drain. Top rod on the individual front with 29lb 8oz was Alistair Ogilvie, who was lucky enough to draw the end section on the Twenty Foot between the Railway Bridge and Chain Bridge - by far the best section which produced the top five weights. Pictured is Phil Hawksley who won a pike match on the Upper Nene on Sunday. He caught two fish for 9lb 15oz. In second place was Anthony Hill with 7lb 15oz. Drawing peg seven in the section, which was one of the better pegs, Ogilvie made a bold decision to really go for it, cupping in a big bed of groundbait and hempseed. He left it alone for close to an hour, taking a good run of fish on the waggler. A switch to his main line brought instant success with fish after fish coming to pinkie and maggot on the whip line. In the same section at Chain Bridge was runner-up Paul Kilby, who caught 27lb 1oz close in on the whip. It’s all change at the top of the leaderboard on the team front as round one winners Sensas Mark One had a day to forget coming in fifth. That let in two very strong teams, Tackle & Bates and Stanjay Silver, who both scored 25 points. There are still two rounds to go so it’s still all to fish for. Result: 1 Alistair Ogilvie, Fabtrays, 29-8-0; 2 P. Kilby, Tackle & Bates, 27-1-0; 3 M. Bickerson, Stanjay Silver, 23-4-0; 4 T. Norton, Browning Hotrods, 22-8-0; 5 S. Hemmingray, Sensas Mark One, 21-0-0. League: 1 Tackle & Bates, 3pts; 2 Fabtrays, 5; 3= Sensas Mark One White, Stanjay Gold and Stanjay Silver, all 6. The Tuesday Club tried their luck on the Bower at Whittlesey last week. On a very cold and frosty morning the fishing was always going to be testing, but some recorded respectable weights. Top rod was Mike Smith from peg six fishing bread punch at six and eight metres for a weight of 7lb 15oz. Runner-up on peg two, again fishing bread punch for a weight of 6lb 1oz, was Danny Needham. Alan Jopling came third finishing with 4lb 11oz from peg five. In the Whittlesey club match on Saturday held on the Carrot Wash section at Pondersbridge there were still fish to be had despite anglers having to work their way through patches of ice. Leading the way was Mark Barron with 5lb 6oz fishing the peg next to the road bridge. He caught on a whip line with pinkie and bronze maggot over groundbait taking a lot of small fish. Runner-up was Jeff Tuttlebee at the opposite end of the match length. He caught on the whip but added a bonus tench taken on the waggler on red maggot to weigh in 5lb 5oz. Third with a net of small fish taken on the pole with pinkie was Tom Wilson. He put 3lb 4oz to the scales. Ramsey AS once again saw plenty of action on their club waters at Ramsey St Mary’s with the whole of the match length fishing really well. Out in front with close to 200 small fish was Keith Rayment. He was restricted to fishing a short pole line after breaking the ice but managed to stay ahead of the field putting 11lb 5oz to the scales. Second was Harry Young, who caught 11lb 1oz on the whip with maggot. Vern Edgeley was third with 9lb 3oz, followed by Ken Taylor on 9lb 1oz. Over the past few weeks it’s been tough going for most anglers fishing the Webb’s AC matches. 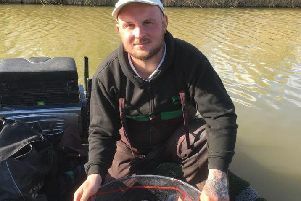 Match organiser George Scally has been switching venues around the area in the hope of finding a water in form, but even the best fisheries have seen some poor returns. In their latest match they fished Lake Ross at Pinchbeck - a prolific water but even this venue has suffered from difficult conditions. Out in front was Peter Telzewski, who caught on the feeder and pole finishing with 29lb 3oz. Second, again fishing a small feeder, was Dave Marzell on 19lb 4oz then came George Scally with 10lb 3oz.